The service principal name for the VMRC server could not be registered. Automatic authentication will always use NTLM authentication. Error 0x80072098 – Insufficient access rights to perform the operation. Network access for Distributed Transaction Manager (MSDTC) has been disabled. 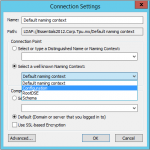 Please enable DTC for network access in the security configuration for MSDTC using the Component Services Administrative tool.